We're giving away some of the BIGGEST Trivia Prizes In Jacksonville every Wednesday night starting at 7:30 pm, with Fast Jax Trivia! Join us at Time Out Sports Grill, located at 13799-5 Beach Blvd., just east of Hodges Blvd., for our fun, fast-moving trivia game. It's FREE to play! Find out how to get TWO Free Answers at FastJaxTrivia.com. Time Out Sports Grill, 13799 Beach Blvd. 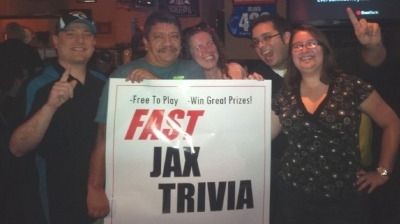 Check out Dates for: Win Some of the BIGGEST Trivia Prizes In Jacksonville!